Tecumseh Land Trust is open for entries in their first ever Sunflower Photo Competition. Go to www.tecumsehlandtrust.org or call 937-767-9490 for further information. The winner will be announced at the land trust’s Harvest Auction September 21st. The winner will receive two tickets to the auction as well as additional prizes. The picture and photographer will also receive recognition in publicity for the land trust’s 2013 auction. Photos must be received digitally or hard copy by September 14, 2012. 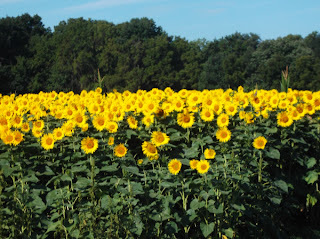 Photos may be taken anywhere, as long as sunflowers are featured. Photos may be e-mailed to krista@tecumsehlandtrust.org or mailed to TLT, Post Office Box 417, Yellow Springs, OH 45387. All photos entered into Tecumseh Land Trust’s Sunflower Photo Competition will be used by the land trust at their discretion in perpetuity including print and promotional materials and the TLT website. TLT will give proper photo credit whenever a photo is used. Entrants retain ownership and all other rights to future use of their photographs.